Nicole Copeland returned a volley in the championship match. A half-hour before their championship match on Friday, Class 2A singles finalists Nicole Copeland and Andrea Jansson were hanging out together, having just had lunch, talking and smiling and enjoying each other’s company. Friends and teammates, soon to be foes. Setting aside that friendship proved difficult, however. 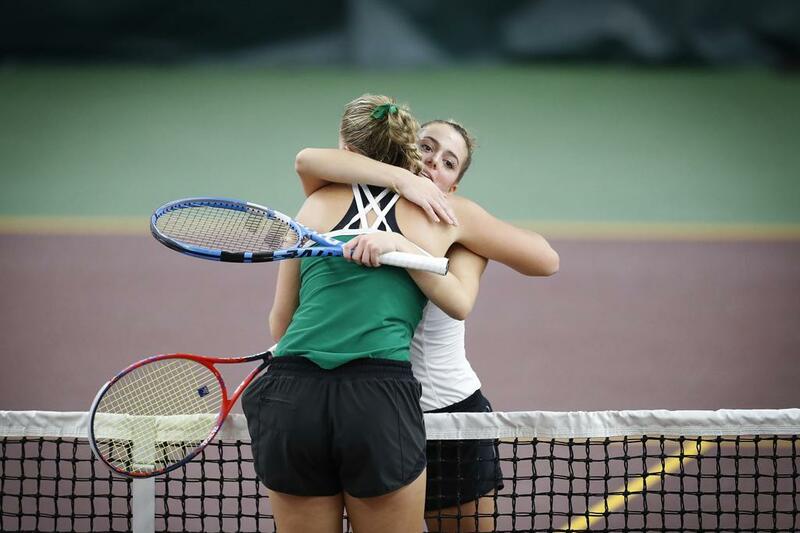 The Edina teammates battled inconsistency, largely stemming from mutual affection, before Copeland, the defending state champion, took control and pulled out a 6-1, 6-4 victory at Baseline Tennis Center at the University of Minnesota. The two players were so close that Edina coach Steve Paulsen didn’t dare speak to either during changeovers. “No, we stayed away. A long way away,” Paulsen said with a laugh. For Jansson, a senior who joined the team last year after her family’s arrival from her native Sweden, familiarity and a case of nerves, along with Copeland’s power game, proved too big a trifecta to overcome. Andrea Jansson of Edina reacts after a missed play. Jansson rallied in the second set, winning three consecutive games to cut the deficit to 5-4, but Copeland was able to close out the match. A small fist pump and a hug for Jansson sufficed for celebration. Copeland became the seventh player in team history to win consecutive titles. This one, she said, was more difficult. When the match was over and the stress had dissipated and the finalists had shared a high five, Copeland compared the two titles. She found not much they’re not much different. In the doubles final, Hopkins seniors Rachel Kelly and Maddie Suk fought back from a first-set loss to defeat Mounds View sisters Taylor and Paige Trondson 6-7, 6-0, 6-1.